Recently, I overheard a couple folks here talking about being homeschooled when they were younger. I was surprised because I wasn’t aware that these Vigets had been homeschooled. The experience made me curious. Just how many people at Viget had homeschooling backgrounds? Had folks been homeschooled in just their primary years or during their high school years as well? Do those with homeschooling backgrounds make up a large portion of our workforce? Additionally, how many Vigets were products of private schools vs. public schools? I decided to send a short survey to staff. I received an 80% response rate (a response rate bested only by surveys that concern food). And, the responses reflected a passion for the topic that intrigued me. As it turns out, nine percent (9%) of Viget staff were homeschooled for at least a portion of their elementary school years (grade 1-8). That figure dropped to four percent (4%) for high school years (grades 9-12). According to the U.S. Department of Education’s most recent data (which covers the 2011-2012 school year), approximately three percent (3%) of the nation’s school-age population is homeschooled and that number continues to grow. During the 1980’s (the average time frame in which our staff was in elementary school), homeschooling was just beginning to gain traction in the U.S. -- so it seems we have a higher-than-expected portion of our workforce with a homeschooling background. 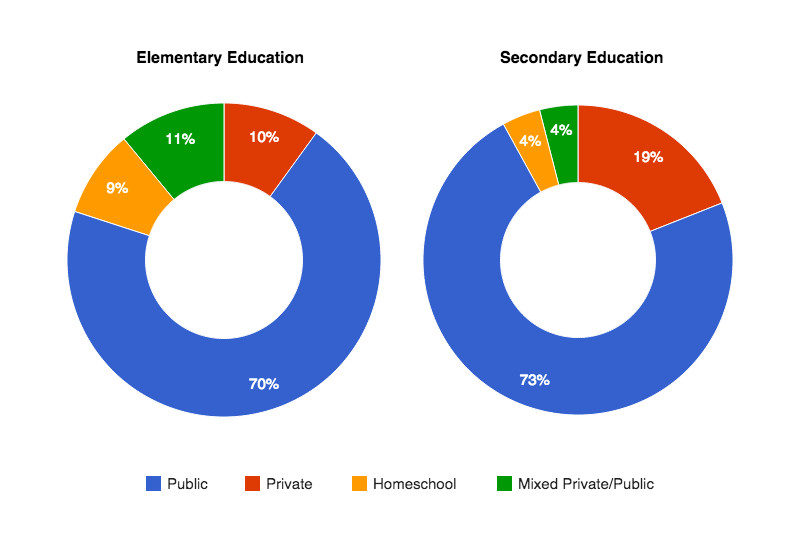 When asked whether staff are homeschooling (or will homeschool) their children, however, only 4% of the staff said they planned to homeschool their kids in their elementary years and only 1% said they planned to homeschool their kids in their high school years. Interestingly, none of those who plan to homeschool/are homeschooling their children were homeschooled themselves. By a large margin, most Vigets are products of public school systems: 70% of us were educated exclusively in public schools during our primary years and 73% of us went to public high schools. An additional 4-11% of us had some combination of private and public school education. Ten percent (10%) of us went to private elementary schools, which is consistent with the national average. The percentage of Vigets who went to private high schools, however, is approximately twice the national average at 19%. Although we now work at one of three offices (in VA, NC, or CO), we grew up and were educated in school systems across the nation. Some of us were military brats who moved from state-to-state. Some of us were lucky enough to grow up in Northern Virginia and attend the top-ranked public high school in the nation. Regardless of the type of education we’ve had, people here are passionate about the positive aspects of each type of schooling. The key role scouting can play in character development. Despite the differences in our educational backgrounds, I think we all agree that education is just one of many factors that have prepared us for success later in life. Curiosity, intelligence, wit, and determination are characteristics that can be fostered within any learning environment -- and are traits shared by all of the Vigets I’m proud to call my colleagues.